Morgan Hoit is a 20-something content creator and book reviewer from NYC. By day, she works in the theater industry. By night, she reads and writes about how each book relates to her life in that moment: part journal entry, part book review. Morgan loves strong coffee, sunny days, and exploring this city she proudly calls home. 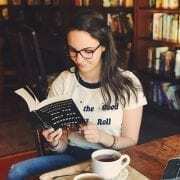 You can find her at www.nycbookgirl.com or @nycbookgirl for NYC tips and tricks, all things book related, and more!